I’m slow to this, but the video debate, featuring Charles Komanoff and others, is here. For those of you who are, say, too gripped by World Cup analysis (Nani is out? Lee Dong-guk might return for South Korea?) to devote too much time to this sort of thing at the moment, Felix handily provides a crib sheet to the full video. Comments Off on Felix Salmon’s Congestion Charging Smackdown. Click here to leave a comment. Rational Safety or Driver Child-Proofing? Reader Kent from New Zealand writes in with news of a new safety technology called “Raptor,” meant to sheathe road-side poles. Many road deaths followed collisions with a tree or pole, James said, and tests had shown that a passenger compartment crush reduced from 500mm, when hitting an unwrapped pole, to 10mm when hitting a pole sheathed with a Raptor. My first thought is: How soon until advertising is sold on those? Second thought is I have no problem with deploying those on high-speed roads, in which case there probably shouldn’t be poles or trees close to the road in the first place, but putting them up on lower speed roads, apart from being aesthetically unpleasant (I mean, really, do you want your town’s streets looking like the pit entrance at Talladega? ), is just further child-proofing that will only encourage more bad behavior from drivers who should know better. Eric Dumbaugh, assistant professor of landscape architecture and urban planning at Texas A & M University, made a strong case that traffic engineers sometimes fail to understand the implications of their own accident data. The problem is that American road builders’ model for a safe road is an Interstate highway – with limited access, wide lanes, and few turning options. The result is that engineers try to turn every road into an Interstate, with serious effects on aesthetics, and on safety too. Dumbaugh argued that there is another model for a safe road, and that is the local street that is “dangerous by design.” Its hazards – curbside trees, for instance – are obvious. They force drivers to slow down, and that makes for greater safety. He showed a slide of a stretch of road in Florida he had studied as part of a larger investigation of car crash sites. This particular stretch is lined by trees – the obstacle traffic engineers love to hate – on not just one but both sides. But it was clear from the picture that this is part of a real neighborhood – the kind of area where a driver instinctively slows down. The road runs through the campus of Stetson University, an area with college students, dorms, and bars. And yet during the five year period his study covered, Dumbaugh said, there was not a single fatal crash there. Comments Off on Rational Safety or Driver Child-Proofing?. Click here to leave a comment. We’ve all been amused by (or at least subjected to) the impromptu road theater of children turning around in the back seat of the car ahead to wave at us (or worse). Although, come to think of it, we probably see that less these days given the heightened awareness toward back-seat passenger restraints — not only do you not want your precious cargo hurtling forward, you don’t want them hurtling forward into you (same goes for dogs, etc.). Trust me, you don’t want to learn about the biomechanics of in-cabin projectiles. But Phil Patton alerts me to a new form of high-concept road theater about to take place in that nexus of art and traffic, Los Angeles: Superclogger. 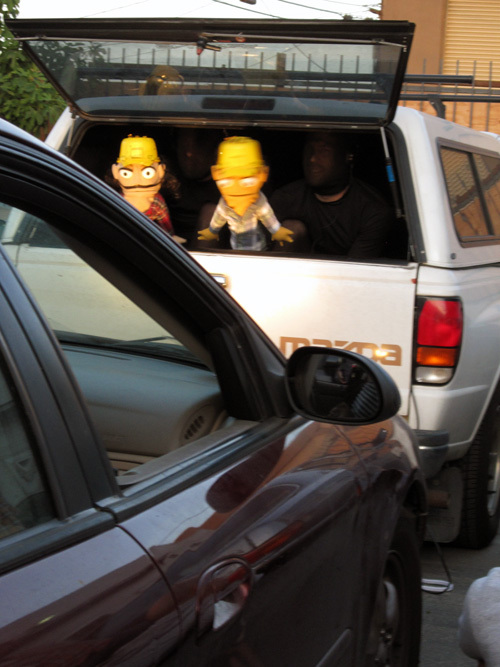 Conceived with Providence-based artist and bike mechanic Peter Fuller and developed out of Kyack’s interest in chaos, performance, and the relationship between individual will and collective control, Superclogger will present various puppet shows to drivers caught in afternoon traffic jams from a mobile theater housed in the back of a nondescript white pickup truck. Broadcasting soundtracks discretely to the viewer’s car stereo, Superclogger aims to briefly halt the progression of chaos by temporarily drawing the audience out of the commute experience and placing them within an intimate space of engagement and performance that highlights their own individual presence within the broader structure of the traffic jam. Comments Off on Superclogger. Click here to leave a comment. Nokia recently discovered the market for pedestrian navigation by chance when it found out that of the 1.4m people who downloaded its car-oriented Ovi Maps app to their smartphones, half of them said they were actually using the maps for walking. The Finnish company has since started to invest heavily in boosting the resolution of its maps to cater for people on foot. Comments Off on The Accidental Pedestrian SatNav Market. Click here to leave a comment.